The global medium and large satellite market for space industry was valued at US$ 171.92 Bn in 2017 and is projected to expand at a compound annual growth rate (CAGR) of over 4.1% from 2018 to 2026, according to a new report published by Transparency Market Research (TMR) titled ‘Medium and Large Satellite Market for Space Industry – Global Industry Analysis, Size, Share, Growth, Trends, and Forecast, 2018–2026.’ This is mainly due to an increase in satellite projects across the globe, which is likely to boost demand for medium and large satellites. Moreover, huge demand for medium and large satellite across military reconnaissance and communication applications is expected to propel the market during the forecast period. The global medium and large satellite market for space industryhas been segmented based on solution, mass, band, orbit, propulsion type, application, and region. Based on solution, the market has been divided into hardware, software, data processing, and launch service. By mass, the market has been categorized into 500 Kg – 1000 Kg (medium satellites) and above 1000 Kg (large satellites). By band, the market has been divided intoX-Band, K-Band, Ka-Band, and Others (Ku Band). In terms of orbit, the market is segmented into GEO (Geo-stationary Earth Orbit), MEO (Medium Earth Orbit), LEO (Low Earth Orbit), and HEO (Highly Elliptical Orbit). By propulsion type, the market is divided into Chemical Propulsion and Electrical Propulsion. Electrical propulsion is further segmented into Electrothermal, Electromagnetic, and Electrostatic. In terms of application, the market has been segmented into navigation and mapping, communication, reconnaissance, and others (earth observation and remote sensing). Based on geography, the market has been segmented into North America, Asia Pacific, Europe, Middle East & Africa, and South America. The Electrical Propulsion (EP) system is a technology that makes use of electrical power to accelerate a propellant by different possible electrical and/or magnetic means.The use of electrical power enhances the propulsive performances of the EP thrusters compared to conventional chemical thrusters. These reduce the mass of satellite and cuts down the launch cost. Hence, electric propulsion systems are expected to contribute to the growth of the market during the forecast period. Furthermore, there are three types of electric propulsion systems categorized according to the method used to accelerate the propellant: electrothermal, electrostatic, and electromagnetic. Electrothermal propulsion systems accelerate the propellant using heating, whereas electromagnetic and electrostatic propulsion systems accelerate the ionized propellant by means of magnetic field and electric field. In terms of application, the communication segment is anticipated to constitute a significant share in 2018. The segment is expected to be driven by factors such as the rising demand for next generation communication systems.This can be further attributed to the requirement for higher bandwidth to provide faster Internet, broadcasting, and radio services. Medium and large satellites can be used to provide robust and sophisticated secure communications network in the military sector. Additionally, satellite communication technology has been used as a means to connect to the internet via broadband data connections from remote areas and hence contributes to the growth of the market. In terms of geography, the global medium and large satellite market for space industryhas been classified into North America, Europe, Asia Pacific, Middle East & Africa, and South America. North America is anticipated to hold a significant share of the market over the forecast period followed by Europe and Asia Pacific. This is primarily due to the United States. Early technology penetration and high space budgets are some factors that provide dominance to the region. Further, the market in Asia Pacific is anticipated to grow at a significant pace in the near future due to the contribution from countries such as India, Japan, Indonesia, and China providing launch facilities for medium and large satellites. 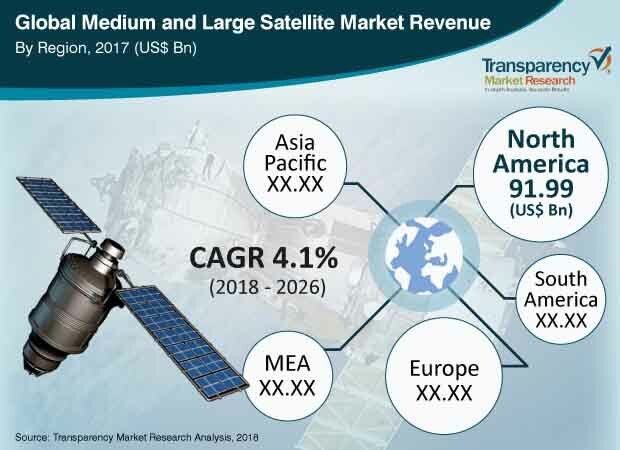 Some of the prominent players identified in the medium and large satellite market for space industry include Gomspace, Lockheed Martin Corporation, SES SA, Inmarsat PLC, Airbus D&S, SpaceX, DigitalGlobe, UrtheCast, AMOS Spacecom, and EchoStar Corporation.